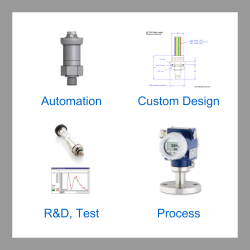 Find a pressure transducer or transmitter for measuring absolute pressures with a millivolt, amplified voltage, current loop or digital output. Absolute pressure sensors measure pressure relative to a perfect vacuum and are typically used in applications such as leak testing, barometric compensation, atmospheric pressure and vacuum measurement. IMP Low Cost Pressure Sensor- Versatile low price pressure sensor with a wide selection of electrical and mechanical options for customisation. PD39X Twin Absolute Digital DP Sensor- Digital pressure sensor with 3 separate channels for measuring P1, P2 and DP readings plus 2 temperature channels. 35X Flush Diaphragm Digital Output Pressure Sensor- Highly accurate digitally compensated pressure transducer with G1/2 male flush pressure port. 33X High Accuracy Digital Output Pressure Sensor- High precision pressure transducer with an accuracy of 0.05% full scale with a RS485, USB or RS232 digital interface for connecting to a PC. DMP331i High Accuracy Pressure Transmitter- High precision pressure transmitter with an accuracy of 0.1%FS BSL NLHR and digitally adjustable pressure ranges from 400mb up to 40 bar gauge & absolute. DMP320 0.5 msec Fast Response Pressure Sensor- High frequency response pressure sensor with a better than 0.5 millisecond response time and internal digital signal conditioning that samples readings at a rate of 10 kilohertz. DMP331 Precision Pressure Transmitter- Stainless steel pressure transmitter with ranges from 100mbar up to 40 bar gauge or absolute. Special options for ATEX , SIL2 and compound ranges. IWPT Wireless Battery Powered Pressure Sensor and Receiver Signal Converter- Wireless battery powered pressure sensor and receiver system for connecting up to 5 pressure sensors without wires to a central wireless receiver which converts each received pressure signal channel to a 1-5Vdc or 4-20mA output. DMP333 High Range Precision Pressure Transmitter- The DMP 333 is a stainless steel 316L wetted parts pressure sensor for high pressure ranges on applications such as hydraulic test benches, presses, and hydraulic actuation. DMP457 Marine Approved Pressure Transmitter- Marine approved stainless steel diaphragm pressure transmitter with 4-20mA current loop output for shipbuilding in ranges from 100mb to 600 bar gauge or absolute. IMP Ceramic Strain Gauge Pressure Transducer- Ceramic strain gauge pressure transducer with a 2mV/V or 10mV/V output signal in pressure ranges from 1 bar up to 700 bar gauge or absolute. TM Silicon Strain Gauge Pressure Transducer- Passive compensated pressure transducer with a four arm semiconductor Wheatstone bridge circuit which produces a 100 millivolt with a 10 volt excitation. TSA Precision Pressure Transmitter- Precision pressure transmitter available with 4-20mA current loop or amplified voltage output signal in ranges from 50mb up to 60 bar gauge and from 500mb up to 40 bar absolute. 23 Ed Flameproof Pressure Transmitter- ATEX approved flame-proof pressure transmitter for containing explosions where there is the potential for flammable process liquids or gases to ignite. 25 Ed Flame Proof Flush Diaphragm Pressure Transmitter- ATEX certified flame proof pressure transmitter with an open face pressure connection for use with pharmaceuticals or high viscosity media. DMP333i Rangeable High Pressure Precision Transducer- High performance transducer with adjustable scaling for modifying the pressure range for different applications. Ranges from 0-60 bar up to 0-600 bar. Send us your enquiry for Absolute Pressure Sensors to get assistance with this product type.